SantaCon 2018 - A feel good event! Come one, come all! 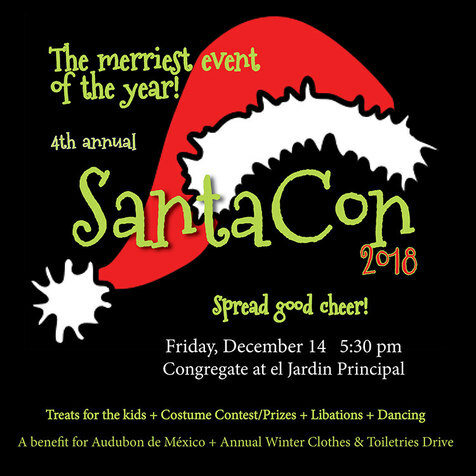 A fun evening of spreading good cheer, starting at the Jardin Principal at 5:30 pm, Friday, December 14. Dressed as Santas and his helpers, we bring smiles to people's faces, hand out candy canes, take photos and collect goods for the annual Winter Apparel & Toiletries drive for people living and working at our local landfill. For those who wish to continue on, our merry band will Ho Ho Ho through the streets, as we make our way to a nearby rooftop for a refreshment. Then we head to our final destination for a costume contest and dancing. Suggested donation to Audubon's environmental programs 200p or give what you can. Click here to visit the SantaCon events page for more details and to let us know if you're coming. Sorry we missed this. Next year!!!! Hmm, and this shows up on this website on January 1 because...? It "shows up" again because there was a comment made to it yesterday. New comments push posts to the top of the list and put them in the email digest. Got it. Thanks for the clarification. Wish I'd been there for Christmas. I was wondering the same thing! Maybe time sensitive posts should be taken down after the event? Is there an easy way to do this? I think posts of old events serve a purpose including being a place where people can post feedback or reviews of the event, ask about plans for the next one, etc.